The moment we've all been waiting for has finally arrived. Formula One is ready to go racing once again, with a full grid, a packed calendar, and plenty of anticipation to kick off the brand new year. We’ve bid farewell to some familiar faces, including last year’s World Champion Nico Rosberg, and we’ve welcomed in some new blood, including Williams rookie Lance Stroll. We’ve got new look cars, splashes of colour throughout the paddock and plenty of changes to talk about. The first race, as always, takes place in Australia, and it couldn’t be more exciting. As mentioned, Rosberg’s retirement caused quite the stir, coming as it did just days after his successful bid to capture the title from rival Lewis Hamilton. However, the dust has settled and we can now get a glimpse of what replacement Valtteri Bottas can do in the new Mercedes, when the pressure is really on. Talking of pressure, Lance Stroll didn’t necessarily shine in testing but has the chance now to recover some of his reputation, as he makes his debut at Williams alongside the now not-retired Felipe Massa. Elsewhere, McLaren endured yet another horrific testing fortnight, with engine problems aplenty. Poor Fernando Alonso is trying to keep a lid on his frustrations, but failing, whilst sort-of-rookie Stoffel Vandoorne must be wondering what he’s let himself in for. The rest of the grid is looking much brighter, with the ever-present yellow at Renault, new shiny blue colours at Toro Rosso, and an incredible pink sheen going on at Force India. You won’t be able to miss the cars this year! Support racing for this event includes Australian GT, Porsche Carrera Cup, and Supercars. It’s been raining on and off during the build up to the race weekend, but as the action gets underway on Friday, things are supposed to clear up somewhat. The long range weather forecasts suggest cloudy conditions but the odd spot of sunshine. Let’s not forget these are late afternoon/early evening races in Australia though, so cool temperatures are to be expected. The Albert Park race track is always a good one to kick off the season – it provides enough of a challenge to test the new machinery, whilst allowing most of the chaos to come from the many variables that have changed heading into the new season. It’s lush and green, and always hosts a popular event. Naturally, all eyes will be on the first corner of the track as the racing gets underway, and it provides a great challenge for the hot-headed drivers desperate for a good start to their season. The ninety degree right-hander sweeps straight back in an arc to the left to get a lap or a race off to a strong start. The middle part of the circuit has walls and trees closing in to surround the drivers as they hustle and bustle for position. A chicane or two helps the drivers navigate their way round the lake and then we're up to the high-speed portion of the lap. Fifth gear corners, sweeping Ascari turns, and some fabulous overtaking opportunities. One thing to watch for, particularly this year just like last, is cars bouncing over the kerbs - this can do more damage than anticipated and even the most mundane of incidents can be race-ending. 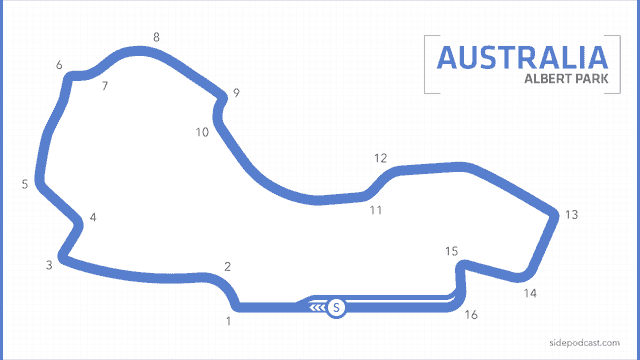 This will be the 22nd race to take place at Albert Park, and the 33rd running of the Australian Grand Prix since 1985. Tweaks to the track this year include additional barrier protection, double kerbs being installed and extra tyres in some of the corner run-offs but the track is still very similar to when it joined in 1996. Four Australian GP winners will take part in the event this weekend, with Fernando Alonso, Kimi Räikkönen, Lewis Hamilton and Sebastian Vettel all having success in the first race of the season. It can provide plenty of upset and unpredictable results though, particularly as it's the first race for the rookie drivers. We'll also see a race without the defending champion for the first time since 1994, thanks to Rosberg's retirement. As you've no doubt seen or heard by now, the tyres that Pirelli are supplying this season are wider than those from last year. The Italian supplier suggest the rubber is 25% wider and that the idea is to provide: "less degradation and fewer peaks of temperature, allowing Formula 1 drivers to push hard during every stint." There was some wet tyre testing completed during the two weeks of pre-season running in Barcelona, but as we head into a weekend of mixed conditions, it's anyone's guess as to how the tyres will hold up. Note: From Australia to Spain, teams will have identical tyre allocations: seven sets of the softest compound available, four sets of the middle compound, and two of the hardest compound. In Australia, these are ultrasoft, supersoft and soft (in order). From Monaco, normal rules apply: teams will select 10 sets of the 13 available. Pirelli will communicate the selections on the Tuesday, 10 days before the race. Dennis Dean President of the Land Speed Records Commission, Member of the International Sporting Code Review Commission, Member of the Commission Internationale de Karting, and Formula E Steward.